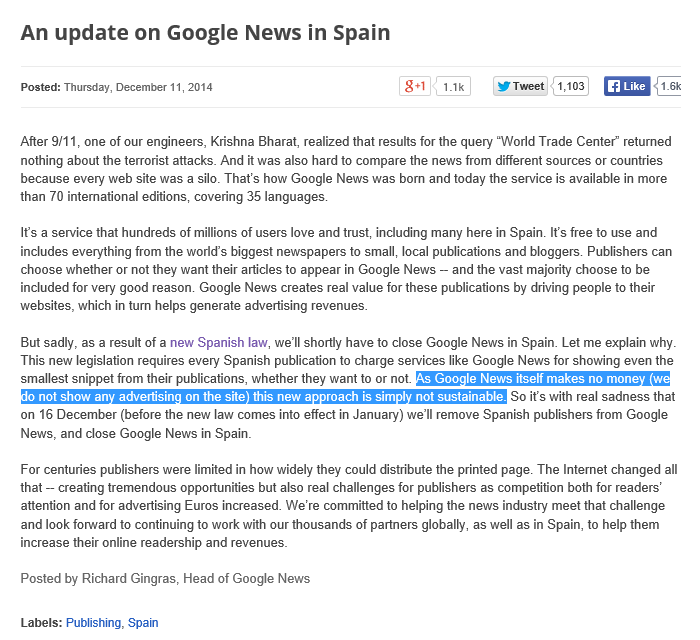 Today Google announced that it's shutting down its Google News service in Spain, because of a new Spanish law requiring Spanish publishers to collect a charge from services such as Google News. Google's argument is that its News service doesn't make any money, and hence it is not sustainable for Google to continue the service in Spain if it has to pay a charge to Spanish publishers. I don't agree with Google's argument. Google News is not a charity product, and Google is not a charity organization. The reason why Google News exists is because it is a vital component of the network of Google products, even though on surface it might appear that the service is really free since Google neither charges for it nor shows ads on it. How then does Google News earn Google something, even if a little? Three ways. First, by feeding into Google's databases information about users' interests [tracked via both clicks on news articles and search queries entered into Google News]. It is of course difficult to accurately measure the contribution to revenue from the user information that Google News generates, but what is clear is that Google News data definitely gives positive help to Google's algorithms to better understand a user, thus improving the overall effectiveness of ads shows on various Google properties to that user. 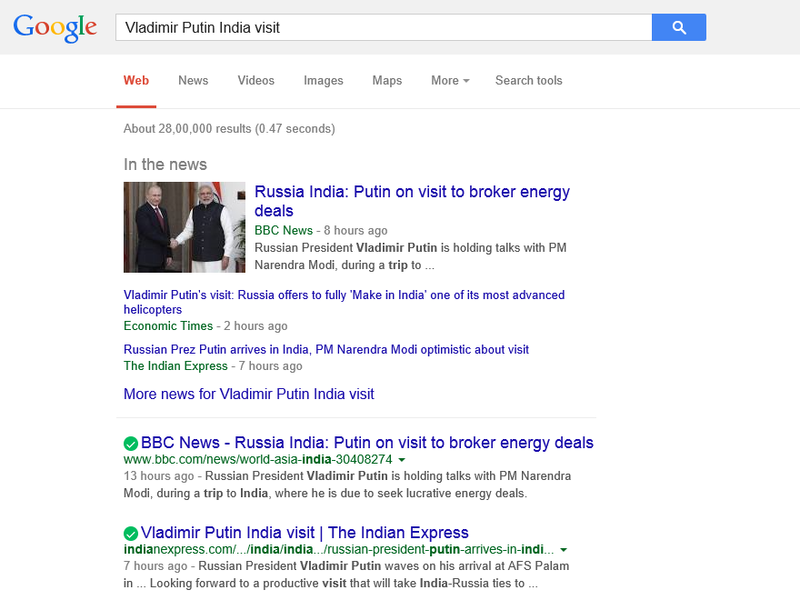 Second, Google News improves user stickiness [retention]. Google doesn't want folks to go to Yahoo or MSN or others in order to look for news, and Google News plays its part in helping to increase retention. If there wasn't any Google News, people would flock to products such as Yahoo News, and maybe would've tried out other Yahoo products as well. Again, it is difficult to measure the precise extent to which this service contributes, but again, what is certain is that the help is positive. Third, since Google News results frequently/sometimes appear on Google's flagship search results page, and since Google shows ads on its main search results page, it is logical to conclude that out of the total revenue earned from ads on the search results page, some contribution comes from the results from Google News. Again, it isn't straightforward to measure the exact percentage of revenue that comes from News results, but it can be stated confidently that the positive contribution exists.